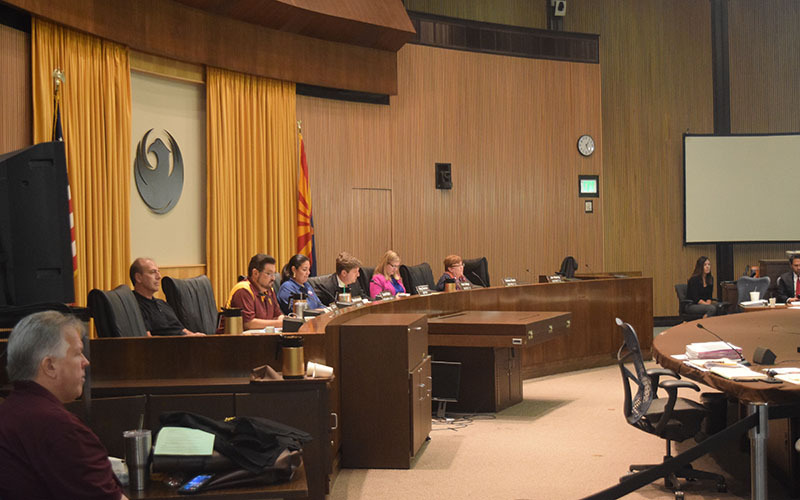 PHOENIX – Dozens of voices were heard during Tuesday’s Phoenix City Council meeting, where a large number of members from the Valley’s Chinese community came out in defense of the cultural center they say is ground zero for their community in the Valley. After more than two hours of discussions, the council voted in favor of allowing the community to commission a survey examining the historical significance of the Chinese Cultural Center on 44th Street by Loop 202. But council members made it clear: The community will have to pay for the survey themselves, and there’s no guarantee the outcome will impact the future of the center. During Tuesday’s meeting, the council also denied another citizen petition to grant the site historical designation, something members of the Chinese community have pushed. 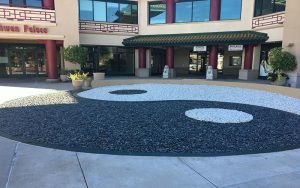 The center has been the subject of heated debate since August after members of the Chinese community learned the center’s new owners planned to turn it into a modern office space. The community began mobilizing to save the center, which has traditional Chinese architecture. 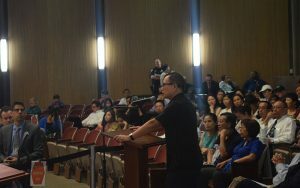 Representatives for the Chinese United Association of Greater Phoenix had asked the council to pass a resolution ensuring the long-term protection of the center. The association also started a petition to save it, which has nearly 16,000 signatures. The Chinese Cultural Center has a variety of stores and restaurants that cater to the Chinese community. (Photo by Angelica Cabral/Cronkite News). Association spokesman Thomas Simon said they have asked the council to update the Historical Preservation Office’s survey of significant Asian-American properties and to include the cultural center. The historical preservation office conducted the last survey in 2007, and it looked at properties built before 1960. The center was constructed in 1997. Michelle Dodds, a historical preservation officer in Phoenix, said when the city examines a property for possible historic designation, that does not necessarily halt demolition. New owners True North Cos. bought the site for $10.5 million in June. On Tuesday, a member of the public asked if there was anyone with the company in the crowd, but there was no response. Jason Rose, a spokesman for the company, said in a statement the construction and preservation processes will go on as planned, and nothing will change because of Tuesday’s meeting. “We appreciate the council rejecting the petition which is an action that’s mindful and respectful of the state’s property rights,” Rose said. Elizabeth Mann, a leader in the Chinese community, brought posters to illustrate what the center means to the community and detail its history. At one point, Councilman Sal DiCiccio said he was around in the 1990s for the negotiations surrounding the building of the center. “I’m going to see this as an affront and a problem if the development company wants to demolish the building and take away a lot of those items in those areas that are very unique to the Chinese community and the building,” he said. Andy Zhang, the vice president of the Arizona Asian Alliance, said that at one point, True North was considering selling the property back to the Chinese community for $30 million. Chinese United Association of Greater Phoenix President Raymond Tang started a GoFundMe fundraising page to save the center. It has raised more than $4,400 of its $200,000 goal. Zhang said members of the Chinese community had previously tried to buy the land, and they have made it clear to the new owner they intend to purchase it. “I can assure you the Chinese community can raise the money to buy it,” Zhang said. However, Rose said the property is no longer for sale. Rose said True North has offered to donate $100,000 for a new Chinese Cultural Center in Hance Park. Rose said the area is home to other cultural landmarks, such as the Irish Cultural Center and the Japanese Friendship Gardens, and it’s near historic Chinese neighborhoods. “We want to contribute positively to alternative locations if that’s desirable to the community in the future,” he said. He added that True North will attempt to preserve the traditional Chinese artifacts they won’t use so they can be used somewhere else. “The new owner is here in the Valley, and various requests have been made, and the goal is to respond positively to as many of those goals as possible,” Rose said. However, the association said in a statement that moving any of the items in the center is equitable to demolition. “These pieces can’t be simply deconstructed like some modern-day Legos set. To take them apart and move them would destroy them,” the statement said. Conversations between representatives for both the Chinese community and True North are ongoing.